Haiti Money: 75 Gourdes for One US Dollar! My fellow Haitians, The US dollar has skyrocketed in Haiti lately... As of November 16 2018, you now need 75 Haitian gourdes for one us dollar in Haiti. What does that mean for a Haitian employee getting paid 25,000 gourdes per month? Divide 25,000 gourdes by 75 and you get $333.33 U.S. per month. In a country where everything is sold "au taux du jour," (at the daily rate of the U.S. dollar) what is a head of household to do with a 25,000 gourdes salary? Once upon a time, that same 25,000 salary was worth 5,000 US dollars. 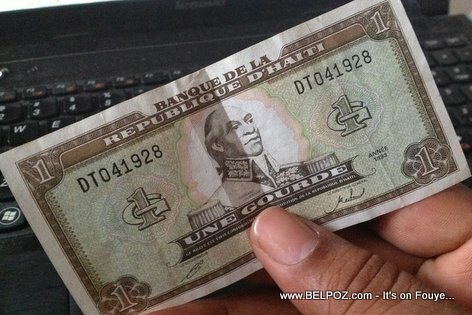 That was in the early 1980's when it was inscribed on the Haitian currency, 5 gourdes for one U.S. Dollar.